Generally common throughtout eastern England and the midlands from the Severn estuary; going west from West Sussex, throughout Wales and the northwest generally records are more scattered and much less frequent. In Scotland there are a few records from southern Dumfries and Galloway and from the Edinburgh area (Luff). Usually associated with wetland habitats; around or near fresh water where the adults may be active in warm weather on bare exposed silt or mud but also in wet meadows or open and damp forest habitats where they occur among moss or leaves (Lindroth). The species occurs throughout our Watford area and we have recorded them from all the local rivers and wetlands. 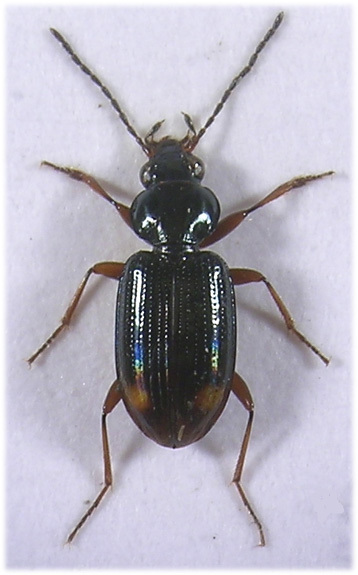 They usually occur among large numbers of other riparian carabids, more especially Bembidion lunulatum, and they are active nocturnally but under these circumstances we rarely encounter more than one two biguttatum among a large sample of carabids from any given situation. The species is a spring breeder (Luff, 1998) and at this time (April and May) we have found large numbers active in bright sunshine on exposed mud (before the vegetation takes over) on the western (wet) side of Common moor in company with Elaphrus spp. 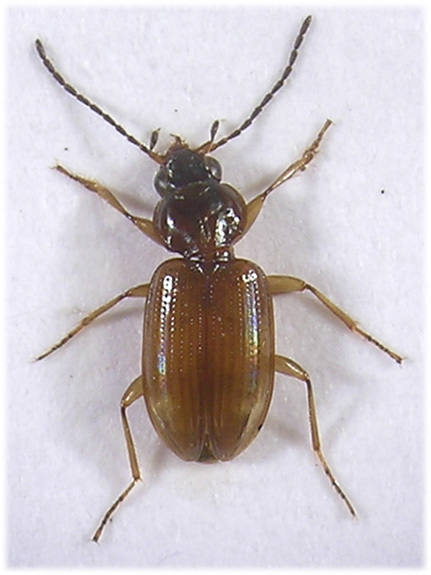 and Bembidion dentellum, in this situation we have also netted them in flight. We occasionally find them in extraction of riverside leaf litter etc and among reed litter samples from Radlett road. Adults occur from April or May and into the summer. The strongly metallic colour is a good indication of the presence of this species. 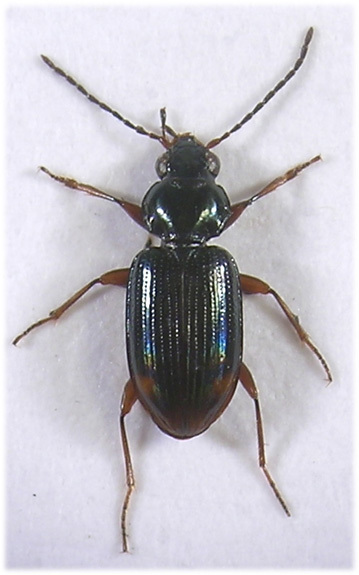 3.8-4.3mm Body black or very dark with a strong blue or green metallic reflection; teneral specimens are brown with the head darker. Head and pronotum shiny with microsculpture indistinct at X40. Head unpunctured between convex and strongly protruding eyes. Two setiferous punctures between inside margin of eyes and well developed, single, frontal furrows. Antennae dark with basal segment pale. Palps dark with base of segments pale, terminal segment of maxillary palps very small. Pronotum smoothly rounded laterally to distinct hind angles and posterior margin strongly produced backwards inside strong lateral sinuations. Lateral border gradually widened from obtuse front angles to hind margin. Basal fovea broad and deep, indistinctly delimited and with a raised ridge along outer margin. Elytra glabrous and irridescent, pale brown from apex to subapical macula, otherwise dark. Scutellar stria well developed. Side border curved over shoulder (ie not angled) but not reaching scutellum. Each with seven striae which are evanescent in apical third; first and second may continue to apex, neither are recurrent. Seventh present as a row of punctures (diagnostic), at least in anterior third. Third interstice with two setiferous punctures, the first situated well before the middle. Legs pale testaceous. Front tibiae deeply notched before straight apical margin which has a single large spur on the outside. Male with two basal protarsal segments dilated.